A variety of opportunities exist for Public Health students to receive financial aid, assistantships, fellowships, and scholarships. For further information on scholarships available to undergraduate students, visit the UMass Amherst Scholarship and Awards webpage. The School of Public Health and Health Sciences (SPHHS) offers the Corinne A. Johnson Memorial Scholarship to undergraduate students in Public Health. 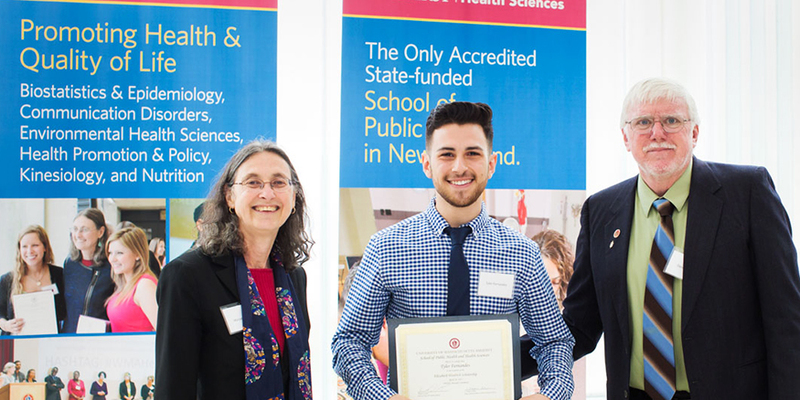 Named after the 1980 SPHHS graduate who achieved much in a shortened life, this scholarship was established by her friends, family and colleagues at General Electric to recognize exceptional students in the field of Public Health. Undergraduate and/or graduate students in Public Health are eligible and are encouraged to apply. Preference will be given to those who exhibit the qualities and spirit of Corinne A. Johnson, including a commitment to community service, volunteerism and leadership. Successful candidates should be deeply committed to public health, have an excellent academic record, demonstrate leadership qualities, show a spirit of community service and be well-rounded in their interests and attitudes. Applications for the scholarship are typically announced and awarded early in the spring semester. Please contact your program advisor for application instructions and forms. The Commonwealth Honors College at UMass Amherst offers a variety of scholarships. Click here for a complete listing. The Center for Multicultural Advancement and Student Success (CMASS) maintains a list of scholarships available to low-income, first-generation and/or students of color who have historically been underrepresented at the university. Visit their Scholarships page for more information. Check out these sites for scholarship listings for undergraduate and graduate opportunities. Also be sure to check the Public Health Newsletter email every week for updates on potential scholarships available!